Patton’s SmartNode™ 4562 Voice-over-VPN Router honored for delivering exceptional VoIP/IP communications solutions. GAITHERSBURG, MD: Patton Electronics—the industry leader in business-class network access, connectivity, and Voice-over-IP equipment—announced today that Technology Marketing Corporation (TMC) has named the SmartNode™ 4562 SoHo Voice-over-VPN router as a recipient of the 2007 INTERNET TELEPHONY Excellence Award presented by INTERNET TELEPHONY magazine (www.itmag.com). The award-winning solution featuring the SmartNode™ 4652, is published as a Patton RealityCheck® success story (available as a free download on www.patton.com). In the solution, Patton partnered with a world-renown systems-integration firm to deliver a 1200-site converged ISDN VoIP-and-Data network with PSTN breakout for a prominent German retail chain. To provide state-of-the-art security for low-cost voice and data communications over the Internet, Patton adapted the SmartNode VoIP platform for Internet Key Exchange (IKE) in less than a month. “It’s a landmark achievement,” said Marco Liechti, product manager. "We're hitting all the targets. Performance, interoperability, quality of service... plus VPN security... all integrated into one platform." 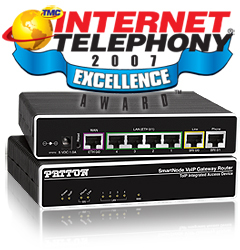 “We are proud to present Patton with the 2007 INTERNET TELEPHONY Excellence Award. The SN4562 Voice-over-VPN router has proven its outstanding contribution to IP communications and delivered winning solutions for its customers,” indicated Rich Tehrani, Editor-in-Chief of INTERNET TELEPHONY. “Taking risks to advance VoIP technology and provide real solutions has earned Patton recognition from the editors of INTERNET TELEPHONY and an INTERNET TELEPHONY Excellence Award. The SmartNode™ 4562 has excelled in delivering solutions and its customers are extremely pleased and have offered their testaments of support,” said Greg Galitzine, Editorial Director of INTERNET TELEPHONY. The 2007 INTERNET TELEPHONY Excellence Award winners have been published in the October 2007 issue of INTERNET TELEPHONY magazine, www.itmag.com. For a high-resolution image of the SmartNode 4562, go to Patton’s media resources page and click on VoIP. Patton is a multi-national organization that manufactures voice and data-communications equipment for carrier, enterprise, and industrial networks worldwide. Incorporated in 1984, Patton markets a catalog of over 1000 products including SmartNode™ VoIP solutions that support SIP, H.323, and MGCP for analog and ISDN telephony; ForeFront™ multi-service access infrastructure solutions for TDM and IP service delivery (T1/E1, G.SHDSL, xDSL, dial-up); IPLink™ CPE solutions for last-mile/local-loop access (WAN routers, modems, remote access servers, NTUs, CSU/DSUs); CopperLink™ Ethernet Extenders; EtherBITS™ device servers; EnviroNET™ NEMA4-compliant hardened networking equipment, and a full range of network-connectivity Micro-Products (interface converters, short-range modems, multiplexers, surge protectors). INTERNET TELEPHONY has been the VoIP Authority since 1998™. Since the first issue in February of 1998, INTERNET TELEPHONY magazine has been providing unbiased views of the complicated converged communications space. INTERNET TELEPHONY offers rich content from solutions-focused editorial content to reviews on products and services from TMC Labs. INTERNET TELEPHONY magazine has a circulation of 225,000 including passalong readers. For more information please visit www.itmag.com.